Please inquire as to available discounts and/or exceptions to minimum night stay requirements. Exceptions will be considered when there are gaps in the reservations calendar shorter than the minimum night stay. Charming 3 bedroom/2 bath home on Suttons Bay with deck and private lakefront with 232 feet of shoreline - no road between the house and the water. Very secluded, sleeps 10. Completely furnished, including grill, patio furniture, washer and dryer, microwave, toaster oven, coffee maker, dishwasher, towels and linens. A dock, canoe and kayak are available for your enjoyment. Also has Wi-Fi internet access. No smoking or pets please. The three bedrooms are all of good size; two have queen beds, and the third bedroom has two XL twin beds in it. All new bedding sets for 2018, new queen beds for 2013. All new flooring in 2015. Remodeled kitchen and bathrooms in 2017. Two full bath rooms with towels are included for your convenience, as well as a full size washer and dryer. Most major appliances were new for 2013; washer & dryer new in 2018. An open kitchen and dining/living room area with large windows overlooking the sparkles on the water will leave you breathless! A great waterfront home in a great location! Need to stay plugged-in while on vacation? Use our free Wi-Fi internet access. Have a boat? Tie up to our secure mooring, and use our dock and canoe for access. Of course, the canoe and a kayak are also available for guests without a boat! Very secluded and private location - the north side of the property is adjacent to wooded undeveloped farm property. The house is about 150 heavily wooded yards east of M-22 - creating a pleasant and welcome buffer from the road (which is not visible from the house). The property is on the water and has direct access to the waterfront - no roads or other barriers to cross. The lakeshore is 17 stair steps below the house/deck. As you stroll the shoreline, watch for the bald eagle nests in the adjacent treetops. Lakefront conditions: As with all lakefront property, the size and sandiness/rockiness of the lakefront varies from year to year along our 232 feet of lake frontage, depending on the ever-changing Lake Michigan water level, winter ice, waves and storms, etc. It is typically a mixture of smooth pebbles and sand. We maintenance the lakefront regularly to provide the best possible conditions that these natural variations will allow. Located next to a vineyard, and just 2.5 miles north of Suttons Bay, this charming home has so much to offer and couldn't have a better location or view. Aside from the 28 vineyards in Leelanau County, this home is only a few miles from the Leelanau Sands Casino, and close to local farm markets, shopping, dining, art galleries and all of the many other attractions of the picturesque Leelanau peninsula. The area hosts many activities; including the Cherry Festival and other local festivals, arts and crafts shows, concerts in the park, casinos, wineries, the Sleeping Bear Sand Dunes (a must), performances at the Interlochen Arts Academy and the Opera House; you're certain to stay as busy or as relaxed as you want to be. Enjoy charter fishinig boats, catamaran sunset cruises, parasailing (for those who are brave), jet-ski rentals, hot-air balloon rides, our local markets, cherry picking (and other fruits depending upon the season), and hiking trails. Looking to golf? Perfect area for that! Fantastic golf courses surround Traverse City. Want to go fishing? Look no further. Shopping? How about a large mall, an outlet mall, and amazing local shops to find that special treasure. The dining is also fabulous, and we have amazing local chefs that will prepare scrumptious meals that you`ll want to tell your friends and family about, not to mention the many restaurants with gorgeous waterfront views. Cancellation Policy: If Renter wishes to cancel their reservation, reservation deposits, rents and taxes are non-refundable unless the vacancy can be filled at the same rate. Partial refunds will be made if the vacancy can be filled at a lower rate, to the extent that the total rent collected exceeds the original rate. In addition, all cancellations are subject to a $100 rebooking fee. If you must cancel your reservation, we will do our best to rebook. The property was part of the Raftshol family cherry orchard when my grandparents and great-grandparents were alive. The cherry orchard has become Raftshol Vineyards, owned and operated by my Uncle Warren. A hair dryer is provided in each bathroom. 32' Samsung HDTV; also have Samsung HD Blu-Ray/DVD player that is Wi-Fi enabled and a Sony Soundbar (Bluetooth enabled) so you can get online movies, TV and music through Netflix, Hulu, and Pandora. I loved this property. I have rented a lot of properties and I have to say this is one of the nicest. The views are spectacular. The setting is peaceful. The location is great for so many activities but then you drive down the wooded driveway and you are transformed to another world. There is so much to like about this place. It is immaculately clean, nicely appointed and if you are a person that likes to cook the kitchen has everything that you will need. Can't say enough good things. This cottage has wonderful features. When we were looking for a place to accommodate both toddlers and senior citizens, our checklist was challenging. But this cottage met most criteria! 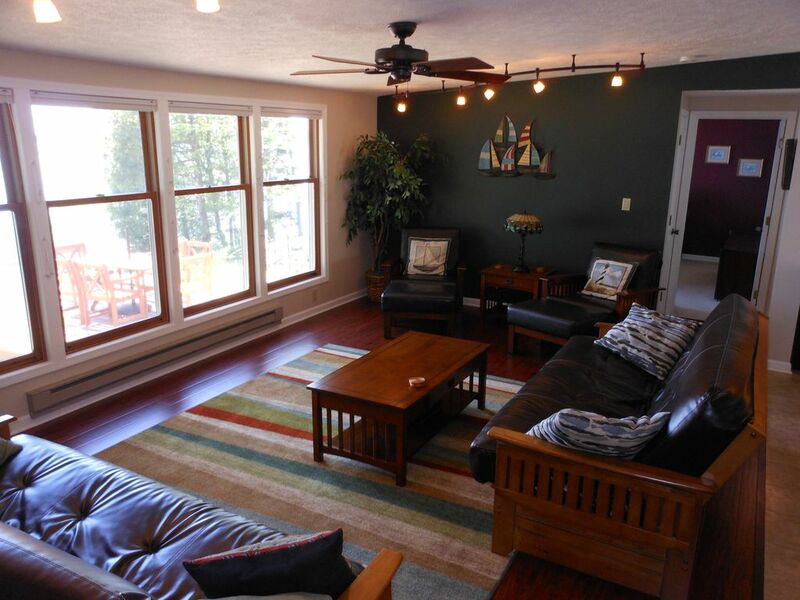 It has a wonderful layout all on one floor, with the master suite on one side of the living area and the additional 2 bedrooms and shared bath on the other side, allowing for privacy. Amenities are top notch, all updated, and the kitchen was a breeze to cook in with ample space. All the furniture was incredibly comfortable and user friendly, and the nearly floor to ceiling windows overlooking the lake were a delight to little ones who could toddle up to them and watch the boats without an adult having to hold them! The deck was ample and afforded a wonderful way to enjoy the fresh air and scenery. I will admit we didn't find the wooden chairs very comfortable, though. But the 2 lounge chairs were comfy.. I will emphasize that there is no beach and the lake bottom is pebbly / rocky so water shoes are a must. It did make it challenging with 2 toddlers. We ended up going to sandy public beaches in SB as well as other lake towns so that they could really enjoy playing at the water's edge and dipping toes in the water. We used both the kayak and the canoe as the lake was mirror smooth. I'd vote for an additional kayak so that 2 could kayak together. We did enjoy lounging a bit on the dock. The location is close to positively everywhere you'd want to go but again, the privacy with the very long driveway leading away from iconic but busy M22 was a godsend. We really enjoyed our stay, weather was perfect as was the property. Would have been nice if there were a set of steps at end of dock and better canoe and Kayak. Overall would say it was one of the nicer properties we have stayed at. Thanks Chris for sharing your home. Wonderful vacation spot in charming Suttons Bay!! Bay Lake Cottage was everything we hoped it would be. We had a wonderful vacation with memories to treasure for years to come. The house was immaculate with all the conveniences of home including but not limited to updated kitchen, bathrooms and appliances. The views of Lake Michigan were spectacular from nearly every room in the house. In addition, the patio furniture provided everything we needed to enjoy the outdoors very comfortably. The lake house was great and the kitchen was well-equipped. We spent a lot of time outside but there were cards and games in addition to the ones we brought from home so there was always fun to be had. The proximity to state, national, and local parks expanded our exploration opportunities. I would definitely stay here again. Located 2.5 miles north of Suttons Bay, on the east side of M-22. Exceptions to minimum stay requirements will be considered on a case-by-case basis. Check-in time is 4:30 PM, check-out time is 10:30 AM. Rates are subject to change until reservation is confirmed. Check or no-fee PayPal payments are eligible for a 1.5% rebate (rebate does not apply to the security deposit). The rebate will be returned along with the security deposit following your departure. Cancellation Policy: If Renter wishes to cancel his/her reservation, reservation deposits, rents and taxes are non-refundable unless the vacancy can be filled at the same rate. Partial refunds will be made if the vacancy can be filled at a lower rate, to the extent that the total rent collected exceeds the original rate. In addition, all cancellations are subject to a $100 rebooking fee. If you must cancel your reservation, we will do our best to rebook.